Pacific Symphony, led by Music Director Carl St.Clair, makes its Carnegie Hall debut in the concluding program of the venue’s season-long celebration of the music of Philip Glass. The program explores the influence of Ravi Shankar and Indian aesthetics on Glass and features the New York premiere of his The Passion of Ramakrishna, a Pacific Symphony co-commission for chorus, soloists, and orchestra that was given its world premiere by Pacific Symphony in 2006. The Pacific Chorale, which sang in the world premiere, will join Pacific Symphony for the performance at Carnegie Hall. The program also includes “Meetings Along the Edge” from Glass/Shankar collaboration Passages and Shankar’s Third Sitar Concerto, featuring the composer’s daughter Anoushka Shankar as soloist. 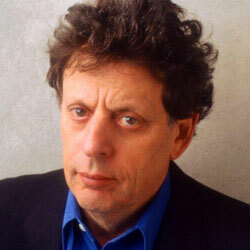 Philip Glass is Carnegie Hall’s 2017-2018 Richard and Barbara Debs Composer’s Chair. The performance takes place at Carnegie Hall’s Stern Auditorium on Saturday, April 21, at 8 p.m. Tickets priced $33 to $95 are available from Carnegie Hall by phone at (212) 247-7800, online at carnegiehall.org, or in person at the box office. Pacific Symphony was invited to perform by Glass and Carnegie Hall after decades of championing the composer’s music in Orange County under Mr. St.Clair. The orchestra’s most significant collaboration with Glass has been The Passion of Ramakrishna, co-commissioned with the Nashville Symphony. The 2006 world premiere of the work by Pacific Symphony and the Pacific Chorale under St.Clair was part of the opening ceremonies for the Renée and Henry Segerstrom Concert Hall, where Pacific Symphony is the resident orchestra. The work was revived and recorded live during Pacific Symphony’s 2011 American Composers Festival, which was dedicated to Glass and—like the Carnegie Hall program—explored the influence of India's music and philosophy on his style and artistic thought. “It would be hard to overestimate the impact that the life, presence and teaching of Sri Ramakrishna had on the formation of the modern India we know today. It was as if the sleeping giant of Indian culture and spirituality—certainly one of the foremost cultures of the ancient world—had been re-awakened and empowered to take its rightful place in modern times. … It is hard to imagine the emergence of India on the world stage without the spark that was provided by Ramakrishna’s brilliance. Perhaps, some may doubt that India—the most populous democracy of our time, brimming with vitality and creativity—could owe so much to one saintly man, long gone, who lived a life of such utter simplicity. Yet I believe that is exactly the case. The work’s text is drawn from The Gospel of Sri Ramakrishna, the principal source for Ramakrishna’s teachings translated into English. 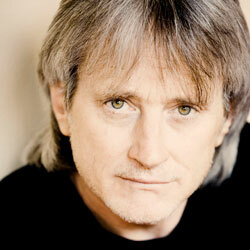 To hear Pacific Symphony’s recording on Spotify, click here. The first half of the Carnegie Hall program relates directly to Mr. Glass’s artistic relationship with sitarist Ravi Shankar (1920-2012). The evening opens with “Meetings Along the Edge” from Passages, a 1990 Glass/Shankar collaboration in which each artist wrote arrangements around themes by the other. “Meetings Along the Edge,” the fifth of the six pieces in Passages, features a mixture of themes by both composers. Passages originally appeared on a Glass/Shankar recording for Atlantic Records, and Pacific Symphony has recorded “Meetings Along the Edge,” available as an iTunes bonus track to The Passion of Ramakrishna album. 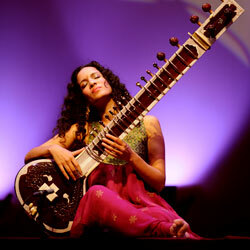 Ravi Shankar’s daughter Anoushka Shankar, a celebrated sitarist in her own right, joins St.Clair and Pacific Symphony in her father’s Third Sitar Concerto. Shankar gave the work’s world premiere in 2009, performing with the Orpheus Chamber Orchestra at Carnegie Hall. This concerto is one of four that Ravi Shankar composed for sitar and orchestra, and Shankar has performed these works around the world, with orchestras including the Berlin, London, Los Angeles, and New York Philharmonics. Saturday, April 21, 2018, at 8 p.m.